Friday, March 1, 2019 at 8:00 p.m. | Theater Lobby Doors At 7:00 p.m. | Theater House Doors At 7:30 p.m. There truly is no place like home as the greatest family musical of all time, the wonderful WIZARD OF OZ, twists its way into Saginaw! The entire family will be captivated as they travel down the Yellow Brick Road and beyond with Dorothy, Toto and their friends, the Cowardly Lion, Tin Man and Scarecrow in this lavish production, featuring breathtaking special effects, dazzling choreography and classic songs. A spectacular celebration of the iconic 1939 MGM film, THE WIZARD OF OZ will blow you away from the moment the tornado touches down and transports you to a dazzling Oz, complete with munchkins and flying monkeys. 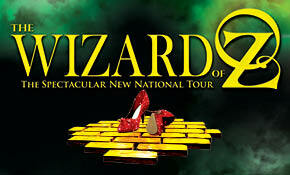 Don’t miss the chance to travel “Over the Rainbow” and experience this national treasure on stage. Venue Presale: Tuesday, January 8, 2019 at 10:00 a.m.
Venue presale tickets will be available online only at Ticketmaster.com with the venue presale code. The venue presale code will be released via email to all venue subscribers at approximately 10:00 a.m. on Tuesday, January 8th. If you do not subscribe to The Dow Event Center email newsletter and would like to receive the venue presale code, please sign up for our emails at https://bit.ly/2LC76Y2 by Monday, January 7th at 11:59 p.m.
On Sale: Friday, January 11, 2019 at 10:00 a.m.
Tickets on sale to the general public will be available at https://bit.ly/2rMZOZU, Ticketmaster by phone 1-800-745-3000 or in person only at The Dow Event Center Box Office. Group Discounts: Group discounts are available with groups of 10 or more. Group discounts are only available in person at The Dow Event Center Box Office. The discount will be applied when the tickets are purchased in one single transaction.